Hank stars the same Hank as in the bestselling Hank Zipzer series, only this time he's in 2nd grade! Hank is a kid who doesn't try to be funny, but he somehow always makes the kids in his class laugh. He's pretty bad at memorizing stuff, and spelling is his worst subject. (But so are math and reading!) 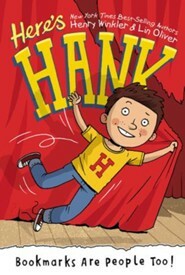 In the first book in this new series, Hank's class is putting on a play, and Hank wants the lead part: Aqua Fly. But he freezes in his audition and can only buzz like a fly. His teacher creates a special part for Hank, a silent bookmark. This may seem like an insignificant role, but when his enemy, Nick McKelty, freezes during the performance, it's up to Hank to save the play! Henry Winkler is an actor, producer, and director, and he speaks publicly all over the world. In addition, he has a star on Hollywood Boulevard, was knighted by the government of France, and the jacket he wore as the Fonz hangs in the Smithsonian Museum in Washington, D.C. But if you ask him what he is proudest of, he would say, "Writing the Hank Zipzer books with my partner, Lin Oliver." He lives in Los Angeles with his wife, Stacey. They have three children named Jed, Zoe, and Max, and two dogs named Monty and Charlotte. Charlotte catches a ball so well that she could definitely play outfield for the New York Mets. Lin Oliver is a writer and producer of movies, books, and television series for children and families. She has written over twenty five novels for children, and one hundred episodes of television. She has produced four movies, many of which are based on children's books. She is cofounder and executive director of the Society of Children's Book Writers and Illustrators, an international organization of twenty thousand authors and illustrators of children's books. She lives in Los Angeles with her husband, Alan. They have three sons named Theo, Ollie, and Cole. She loves tuna melts, curious kids, any sport that involves a racket, and children's book writers everywhere. I'm the author/artist and I want to review Bookmarks Are People Too! #1.